Star Wars Imperial Assault is an epic adventure board game in the Star Wars universe for 2-5 players. The mighty Imperial army and a cadre of deadly bounty hunters face off against daring Rebel heroes in a series of tactical combat missions. Iconic characters like Darth Vader and Han Solo raise the stakes in the epic campaign. Each battle escalates towards a climactic final showdown between the Galactic Empire and the Rebel Alliance. 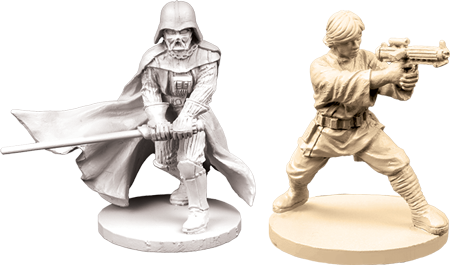 Star Wars Imperial Assault is your chance to change the fate of a galaxy far, far away! You can enjoy two complete games in the Star Wars universe - the campaign game and the skirmish game. Star Wars Imperial Assault contains 34x figures, including; an AT-ST, Darth Vader and Luke Skywalker - here is a link to the Star Wars Imperial Assault Learn To Play Guide.